In recent years, a significant increase in elderly population, modernization, industrial improvements, and greater involvement of women in the workforce have led to an increase in elder abuse. Naughton et al. assessed the prevalence of elder abuse and neglect in the Irish community and found emotional abuse in 1.2% of individuals aged >65 years. Acierno et al. conducted a study on the prevalence of, and relationships between types of, elder abuse in the United States and found emotional abuse in 4.6% of individuals aged >60 years. A similar study in Spain determined that 15.2% of the individuals aged >75 years were exposed to emotional abuse. Another study reported that 13% of the elderly people living in long-term care homes in Michigan were exposed to emotional abuse. A limited number of studies have been conducted on elder abuse in Turkey. In this regard, a study conducted by Aslan in which he investigated the situations and factors affecting the abuse and neglect, the emotional abuse perceived by elderly individuals is found out to be moderate. Özer performed a study to determine depression, abuse, and neglect in elderly individuals and found that 51.4% of them experienced at least one episode of emotional abuse. İlhan conducted a study on the determination of domestic elder abuse and found that 18.2% of the participants aged 65 years and above were exposed to domestic abuse, 40.5% of which were in the form of emotional abuse. The current literature shows that elder abuse is an important public health problem that should be evaluated from all aspects. It is important to consider this issue comprehensively to identify the current situation of elder abuse, determine the factors responsible for it, prevent the abuse, and put forward concrete applications for dealing with such cases. Nurses are responsible for maintaining and improving the health and well-being of elderly people in care settings. Elder abuse is a priority issue that must be addressed and recognized by nurses while fulfilling their responsibilities for patient advocacy and maintaining patient safety during the care of elderly individuals as a vulnerable group. It can be said that nurses have a priority position in health-care services in recognizing and preventing elder abuse. Therefore, this descriptive study was carried out to evaluate the level of emotional abuse perceived by the elderly people living in nursing homes. This study was important because it was the first step toward determining the status quo. This descriptive study was conducted to assess the level of emotional abuse perceived by elderly people living in nursing homes. The study was carried out at the Nursing Home Elderly Care and Rehabilitation Center affiliated to the Adana Provincial Directorate of the Ministry of Family and Social Policy in Adana, Turkey. A total of 280 elderly people live in the nursing home, rehabilitation, and small house sections of the center. The center consists of indoor and outdoor areas comprising various service units such as library, multipurpose hall, art workshop, cafeteria, tailoring service, hairdressing salon, and a tooled sports center for elderly people. In addition, the residents can take part in the theater and choir working groups of the center. The center employs seven nurses, one doctor, one physiotherapist, one sociologist, two psychologists, one social worker, and 45 patient care staff. The nurses at this center carry out duties such as preparing medicines for the elderly, taking vital signs, and wound care. The study universe consisted of all elderly people living in the Nursing Home Elderly Care and Rehabilitation Center affiliated to the Adana Provincial Directorate of the Ministry of Family and Social Policy in Adana, Turkey. This elderly care home was chosen for the reason that it is the largest institution in the city. This institution provides care home, old age home, and rehabilitation service. Elderly who live in the institute usually come from the middle-income level of Adana province and the surrounding provinces, often with a low wage, which they can meet their needs and are usually retired and pay their salaries. A small number of nonrevenue groups are paying no fees. A total of 280 elderly individuals live in this nursing home. However, 80 elderly individuals in the private care unit of the nursing home were not able to fill the scale and forms. Therefore, taking into consideration the remaining 200 elderly individuals at the center, it was determined that a minimum of 111 elderly persons should be included in the study using the simple random sampling method. A total of 118 elderly individuals selected from the random number table were included in the study by reaching the individuals who met the criteria of studying in this direction. The inclusion criteria were as follows: accepting to participate in the study, being fluent in Turkish, not having hearing and speaking problems, and having sufficient communication skills. Accordingly, a total of 118 elderly individuals who met the selection criteria were included in the study. The research data were collected using a personal information form and the perceived emotional abuse scale for adults (PEASA). The data were collected by the researchers in a face-to-face interview in the participants' room. Individuals have been interviewed in their own chambers to ensure privacy. Researchers are not institutional employees, and the purpose of the research is described and announced to be withdrawn when requested. The PEASA, which was developed by Ersanlı et al. to determine the level of emotional abuse perception in individuals, was used in this study. This scale consisted of 61 items. The reliability of the scale in terms of stability and internal consistency was examined using the test–retest method and calculating the Cronbach's alpha reliability coefficient, respectively. Test–retest reliability (r), which was calculated with the biweekly application of the whole scale, was found to be 0.76. The internal consistency reliability (α) of the inventory was calculated as 0.95. The scale was designed as a 5-point Likert-type scale with the following scoring options: strongly agree (5), agree (4), undecided (3), disagree (2), and strongly disagree (1). Of the 61 items, 58 had negative expressions, while 3 had positive expressions. Items 8, 21, and 54 were scored in reverse for control purposes. The lowest and highest scores that could be taken on the scale were 61 and 305, respectively. The high score on the scale indicated that the individual perceived a high level of emotional abuse. There is no specific domains for the scale. The highest score on the scale indicated that the individual perceived a high level of emotional abuse. The IBM SPSS Statistics 22 (IBM SPSS, Turkey) program was used to perform the statistical analysis for the evaluation of the research data. The Shapiro–Wilk test used to determine the data distribution detected that the data were not normally distributed. In addition to descriptive statistical methods (mean, standard deviation, and frequency) used in the evaluation of the research data, the Mann–Whitney U-test was used to assess whether two independent groups were significantly different from each other. In addition, the Kruskal–Wallis test was used to evaluate the relationship between three or more groups. The statistical significance level was set at P < 0.05 for all analyses. An approval of the Ethics Committee of Clinical Investigations at Çukurova University and written permission from the Provincial Directorate of Family and Social Policies at the Governorship of Adana to carry out the study were taken before starting the application process. Participation in the study was based on volunteerism, and the volunteers were informed about the issues of confidentiality, privacy, and so on. They were also informed that they could discontinue their participation in the study any time. The mean age of the elderly participants was 74.63 ± 6.76 years; of these, 50.2% were male, 70.3% were married, 29.7% were primary school graduate, and 83.1% had children. In addition, 49.2% of participants had a balanced income, 62.7% had visiting relatives, 51.7% visited their relatives, and 24.6% suffered from both diabetes and hypertension. Moreover, the participants were living at the center for a mean of 5.44 ± 4.21 years. The distribution of the mean PEASA scores of the elderly individuals participating in the study is shown in [Table 1]. Their mean PEASA score was determined as 133.86 ± 35.23. The mean PEASA score of elderly individuals with and without children was found to be 130.54 ± 34.27 and 150.10 ± 36.23, respectively. No statistically significant difference was found between the mean PEASA scores according to other descriptive characteristics of the elderly individuals (P > 0.05). The internal consistency coefficient (Cronbach's alpha) of the PEASA was determined as 0.958. Elder abuse is an important problem affecting elderly health, which has increasingly become widespread in recent years. This descriptive study was conducted to evaluate the level of emotional abuse perceived by the elderly people living in nursing homes. The mean PEASA score of the elderly individuals participating in this study was determined as 133.86 ± 35.23. The lowest and highest scores that could be taken from the scale were 61 and 305, respectively. Hence, it could be concluded that the mean PEASA score of elderly people living in nursing homes was slightly above the scale mean score in general, and these elderly individuals perceived moderate emotional abuse. In the present study, the level of emotional abuse perceived by elderly people was determined as moderate. Although daily chats among the nursing home workers included many expressions related to the perceived emotional abuse of the elderly residents, it was remarkable that the elderly residents denied those statements of emotional abuse during the data collection process. This could be explained by the fact that elderly people tended to reflect the status quo more positively than they perceived because of the feeling of anxiety about the negative effect on their relations with people in the environment. Nevertheless, although people in Turkish culture can frequently express their negative experiences in casual conversations with friends, they may hesitate in expressing a negative situation directly to individuals who are not their friends. This may be related to the fact that elderly individuals do not feel comfortable expressing themselves. Moreover, it is stated in the literature that the rate of elder abuse does not exactly reflect the reality and may actually be higher. In the present study, the mean PEASA score of elderly individuals without children was found to be statistically significantly higher than that in elderly individuals with children (Z= - 2,012, P = 0.044). Accordingly, elderly individuals with children perceived lower levels of emotional abuse than those without children. Lachs and Pillemer conducted a compilation study to assess elder abuse and suggested that social isolation and low levels of social support were the risk factors for elder abuse in people living in long-term care settings. Garre-Olmo et al. reported a significant relationship between emotional abuse and social isolation in the elderly people and stated that the level of psychological abuse in the elderly individuals living alone was significantly higher than the level in those living with someone else. Naughton et al. suggested that the level of physical, sexual, and psychological abuse observed together in the elderly people with low levels of social support was significantly higher. Family relations, care for elderly parents, and frequent visits of elderly relatives are extremely important in Turkish culture. For the elderly people, their children and grandchildren are the most important sources of social support in old age. The children of the elderly who participated in this study contacted them on phone and visited the nursing home on a regular basis. This suggested that the elderly received a positive social support from their children. In the present study, the significantly lower levels of perceived emotional abuse in elderly people with children than in those without children might be associated with the receiving of positive social support from their children. This study provided information on a small sample group because it was carried out in a nursing home located in the Adana province. Hence, the study results could not be generalized over the whole society. Therefore, larger-scale studies are required at the national level for better results. The study results showed that the mean PEASA score of elderly people living in nursing homes was slightly above the scale mean score in general, and these individual perceived moderate emotional abuse. It is important to determine the level, incidence, and relevant variables of emotional elder abuse significantly affecting the health of elderly people. Thus, the prevention, protection, and improvement measures and studies for elder abuse can be planned in accordance with the obtained research results. Therefore, it is recommended to carry out new studies in this field both at a regional level and on a broad scale. World Health Organization. Elder abuse. Available from: http://www.who.int/ageing/projects/elder_abuse/en/Published2014. [Last accessed on 2017 Oct 18]. Lachs MS, Pillemer KA. Elder abuse. N Engl J Med 2015;373:1947-56. Dong XQ, Simon MA, Beck TT, Farran C, McCann JJ, Mendes de Leon CF, et al. Elder abuse and mortality: The role of psychological and social wellbeing. Gerontology 2011;57:549-58. Wallace RB, Crabb VL. Toward definitions of elder mistreatment. In: Dong X, editor. Elder Abuse, Research, Practise and Policy. USA: Springer; 2017. p. 3-21. Donder L, Luoma ML, Penhale B, Lang G, Santos AJ. European map of prevalence rates of elder abuse and its impact for future research. Eur J Ageing 2011;8:129-43. Dong X, Chen R, Chang ES, Simon M. Elder abuse and psychological well-being: A systematic review and implications for research and policy – A mini review. Gerontology 2013;59:132-42. Naughton C, Drennan J, Lyons I, Lafferty A, Treacy M, Phelan A, et al. Elder abuse and neglect in ireland: Results from a national prevalence survey. Age Ageing 2012;41:98-103. Garre-Olmo J, Planas-Pujol X, López-Pousa S, Juvinya D, Vilà A, Vilalta-Franch J, et al. Prevalence and risk factors of suspected elder abuse subtypes in people aged 75 and older. J Am Geriatr Soc 2009;57:815-22. Post L, Page C, Conner T, Prokhorov A, Fang Y, Biroscak BJ. Elder abuse in long-term care: Types, patterns, and risk factors. Res Aging 2010;32:323-48. Aslan H. The Olders' Exposure to Abuse and Negligence Situations and Effective Factors. [Thesis]. Malatya: İnönü University; 2012. Özer N. Determining Depression, abuse and Neglect in Elderly İndividuals. [Thesis]. Gaziantep: Gaziantep University; 2013. İlhan F. Detection of Domestic Elderly Abuse in the Anatolian Region of Ankara Province Yenimahalle District. [Dissertation]. Ankara: Gazi Univiersity; 2006. Ersanlı K, Yılmaz M, Özcan K. Emotional abuse perceived scale (EAPS): Study of validity and reliability. Ondokuz Mayıs University Jornal of Faculty of Education 2013;32:147-64. Ergin F. Elderly Abuse/Neglect Prevalence and Related Factors in Aydın Center. 15. National Public Health Conference, Conference Book. Bursa, Turkey; 2012. p. 1079-81. 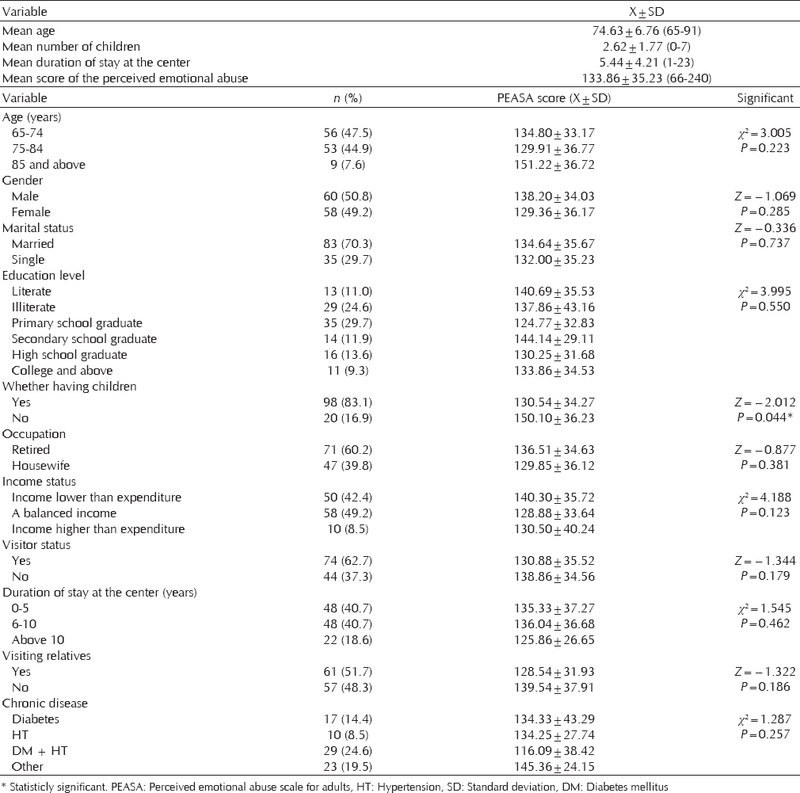 Dong X, Simon MA, Gorbien M. Elder abuse and neglect in an urban Chinese population. J Elder Abuse Neglect 2007;19:78-96. Sooryanarayana R, Choo WY, Hairi NN. A review on the prevalence and measurement of elder abuse in the community. Trauma Violence Abuse 2013;14:316-25. Castle N, Ferguson-Rome JC, Teresi JA. Elder abuse in residential long-term care: An update to the 2003 national research council report. J Appl Gerontol 2015;34:407-43. Natan MB, Lowenstein A, Eisikovits Z. Psycho-social factors affecting elders' maltreatment in long-term care facilities. Int Nurs Rev 2010;57:113-20. Dong X. Advancing the field of elder abuse: Future directions and policy implications. J Am Geriatr Soc 2012;60:2151-6.